A few weeks ago, my 5-year-old daughter was in the car with me. We were driving to the post office and happened to hang a left on a road she recognized. “Daddy, school is that way!” she said excited. The kids had been on break for a couple of weeks, and this little turkey was anxious to get back to her teacher and friends. Truth be told, I was a little nervous about sending her to Kindergarten because I wasn’t sure she was ready. I was totally off base. My little girl loves learning. She’s excited by it. Every day, she insists on showing me all the “sight words” she knows and the new math problems she’s figured out. I don’t know about you, but when I was in Kindergarten, we just learned our ABCs and tried not to pee on our rugs during nap time. I can’t tell you how thrilled I am that she enjoys school. I’m really excited for her to be a life-long learner, and I have big dreams for her future. Of course, those dreams include her earning a college degree. As a financially conscious parent, I know that education won’t be cheap – for either of my daughters. Being a parent yourself, you probably have the same college dreams for your kids. If so, saving for college is one of the most important things on your money checklist. Whether your student is age 3 or 13, it helps to know your savings options ahead of time; the earlier you start planning, the better off they’ll be. You’ve probably heard that college costs are rising. According to the most recent numbers from the National Center for Education Statistics, even when adjusted for inflation, the cost of college in 2014 was over 28% higher than it was just a decade before. With that in mind, it makes sense to start thinking about how to help your kids pay for college now. Here are a few options. Since the kids were very young, we’ve been contributing to a 529 college savings plan. These are special investment plans intended to offset the costs of higher education. The money in the plans grow tax-free, provided the funds are used for qualified expenses. 529 plans are handled individually by each state, so different rules apply everywhere. In our home state of Indiana, for instance, we receive a 20% tax credit on the first $5,000 contributed each year. So, if we max out the credit, we get $1,000 back on our state income taxes – which is a pretty sweet deal. Be sure to check your state’s rules to see if a 529 plan makes sense for you. If your state’s 529 plan isn’t as attractive, you might consider saving for college in a Coverdell Education Savings Account or ESA. Like with a 529 plan, an ESA is a tax-advantaged way to save money for your child’s college expenses. Provided the money is used on qualified educational expenses, withdrawals can be made on a tax-free basis. You can also use the money in these accounts to pay for expenses at K-12 schools, which is a nice benefit for some. Even if you’re saving for college, chances are good that your child may still need to take out some loans to cover the costs. When I went to college, I used a combination of subsidized and unsubsidized federal loans to get me through. These loans helped pay for both my school costs and living expenses. When your child is ready to head off to college, be sure to complete the Free Application for Federal Student Aid form (FAFSA) to apply. In addition to my federal loans, I also used a few private loans to pay for college. These loans come from private banks and credit unions and can be used for tuition costs, living expenses, and more. There are some differences between private and federal loans, with the biggest being how interest rates are determined. Rather than a set standard rate, interest rates are calculated based on the borrower’s (and/or cosigners’) credit. I found this free guide to private student loans which walks you through more of the details. When the time comes, you’ll definitely want your student to apply for as many scholarships and grants as possible. While most scholarships aren’t huge, every dollar you’re not paying interest on helps. Plus, earning several smaller scholarships can add up quickly. To learn about available scholarships and grants, have your child check with their high school guidance counselor, the financial aid department at their college, and online through scholarship finders like this one. 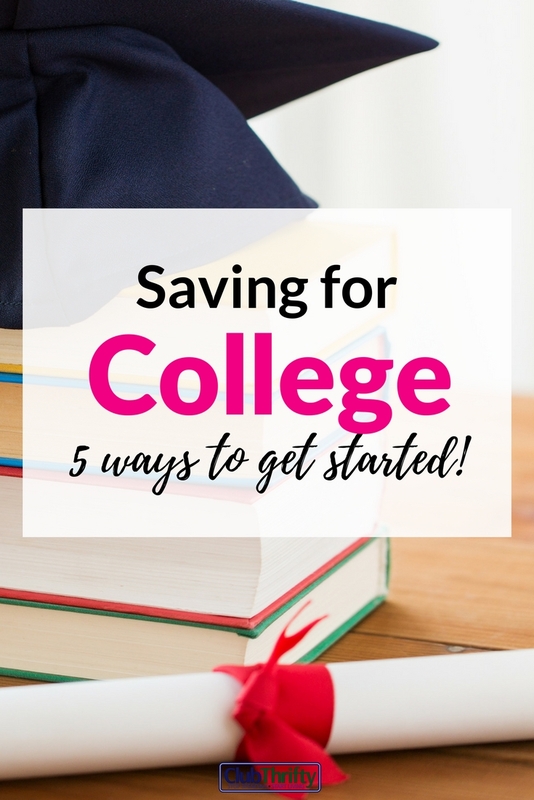 Saving for college takes some effort, but it isn’t impossible. With several different tools available, your dreams of funding your child’s college education can happen. Remember, when saving for college, your biggest asset is time. By saving early, you’ll be prepared to help your child avoid the crushing weight of student loan debt. Good luck and get to saving! It is tougher than ever these days, but you’re not going to get a job in tech with a high school diploma. Great tips! I don’t claim to be an expert but here’s how we managed to fund our son through his Master’s degree with ZERO student loans. It is sort of a long explanation but here goes…. I started his college fund as soon as we found out I was pregnant. It started in our credit union and I put something in it every month. Sometimes, if it was a lean month, it might just be $25 but I was faithful with the deposits. After I built up $1000 I put it into a low cost, growth mutual fund, adding money to that each month but continuing to put money into the credit union. At the time, CD rates were quite good so I occasionally put money into CDs. Every time we received cost of living or merit raises, I diverted part of the increase to his funds. Eventually we were contributing quite a bit each month. When he was a teenager, and began to work, he put part of his paychecks in the bank, ad I considered that would be his spending money when in college. He worked after school and in the summer except for when he was in athletics during school year. Upon graduation, he earned scholarships which helped for his undergraduate work. He took advance placement exams and earned enough credits toward a full semester which saved money. He chose a major and didn’t change it. (Do people realize how much it costs to change majors and need extra time to complete requirements for the new one?) Upon graduation he was accepted into a master’s program at a different school which provided no student housing so we did need to pay for him to live in an apartment . However, based on the difficulty of his undergraduate curriculum, the school waived requirements for the first year of his master’s program AND he received a scholarship that paid his full tuition. So he completed his master’s in a year and a half instead of the normal two and a half saving us living expenses for the extra year. This was a true partnership between him and us, with him providing the brain that earned him scholarship money as well as working, and us providing the financial backing. I don’t expect everyone to be in our circumstances and since his college years costs have escalated tremendously, but there are ways to ease the burden. I really wish my parents would have been able to help pay for my siblings and my college education. They just didn’t make enough to save for 5 kid’s schooling. But any little bit helps! I’ve been invested in 529’s for my three kids for years now. One tip I would share is to start early and save often, even if its small amounts. Many 529’s can be opened with as little as $25, and you can put in $25 per month automatically. Sometimes people think small amounts won’t make a difference so they don’t bother – but those small amounts really do add up over 18 years! These are all good options. I wish more people looked into scholarships – many people think that they’re not worth the work!